I ate a hot dog at 9:30am in Los Angeles. True Story. Don't judge. Give me a moment to explain. 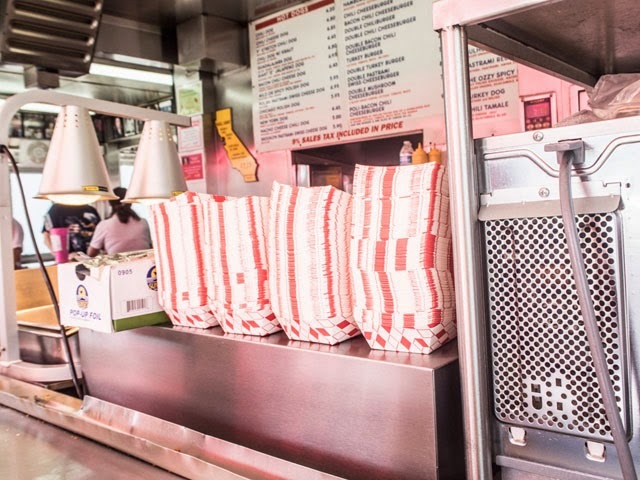 Pink's is a bit of an institution. 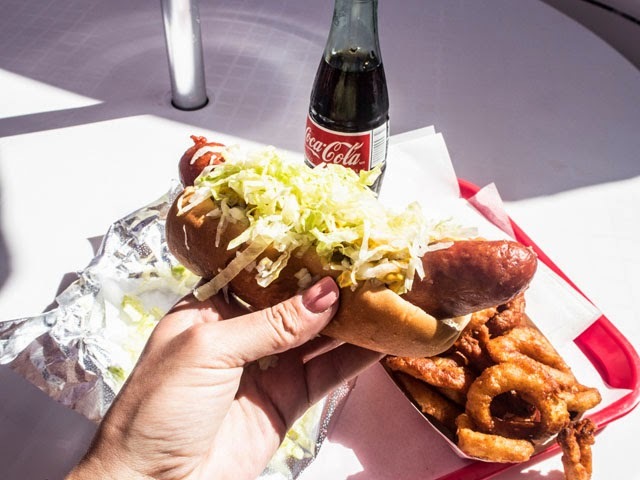 As far as hot dogs go, hot dog enthusiasts know that this is THE place to chow down on your dirty dog. It doesn't get much more real than this, folks. 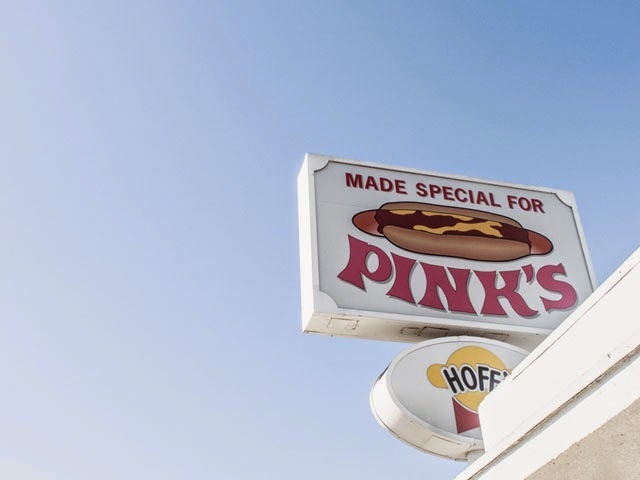 Pink's is the the top dog, end of, and has been for 75 years! So, of course, this was all hearsay in the beginning. I had heard from everyone that this was a culinary experience, that it needed to be tried and that your patience would be tried along the way. 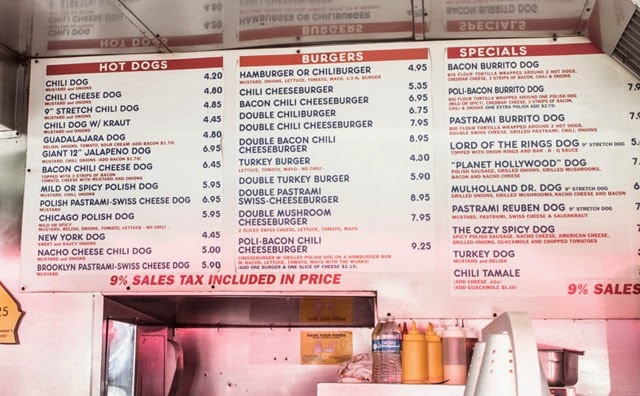 This was the best hot dog in Los Angeles, perhaps the best in the world, but the experience doesn't start and finish with the food. You see Pink's isn't a place where you grab a table and wait to be served. Oh, no. Pink's is a place where you queue. And you queue. And you queue. 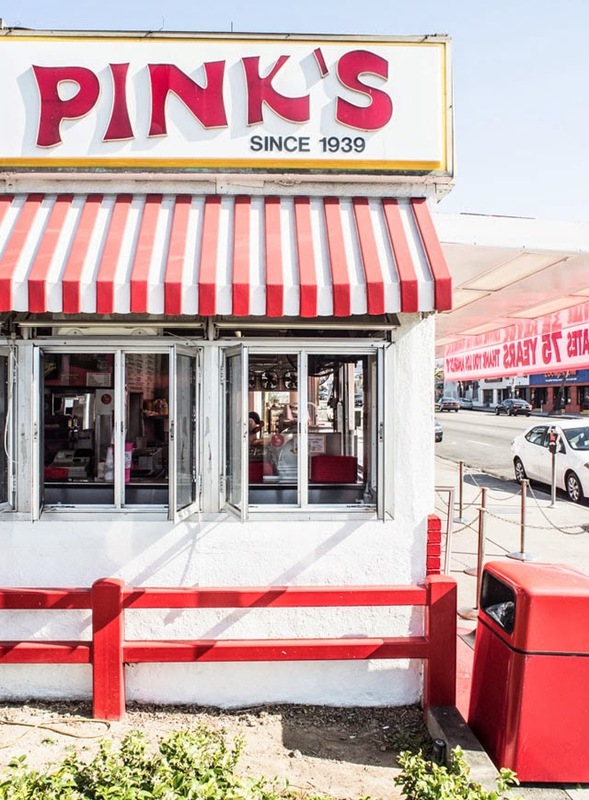 Every time I drove by Pink's in Los Angeles, the line to score a hot dog was ridiculously long. We're talking a good 50-100 people at any given moment and don't even get started at the line for lunch. 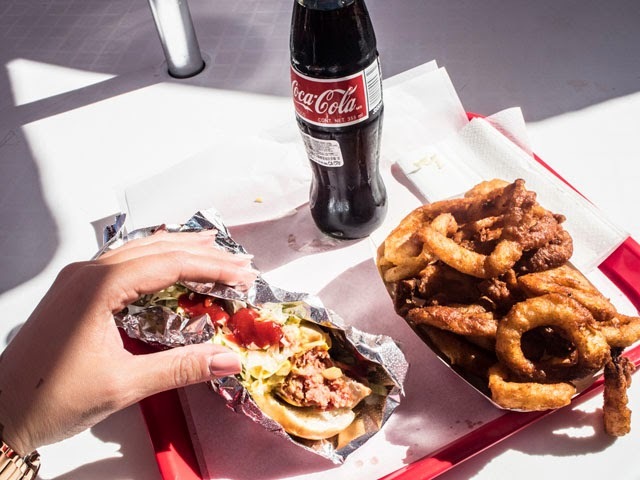 Knowing that Pink's was a crazy wait, I let the idea of eating there go. I decided no dog was worth my dishing out loads of time for the privilege, and I went on my merry way. Then, I found myself driving by Pink's at 9:15am on the way back from an early morning project. Three people were gathered in line. 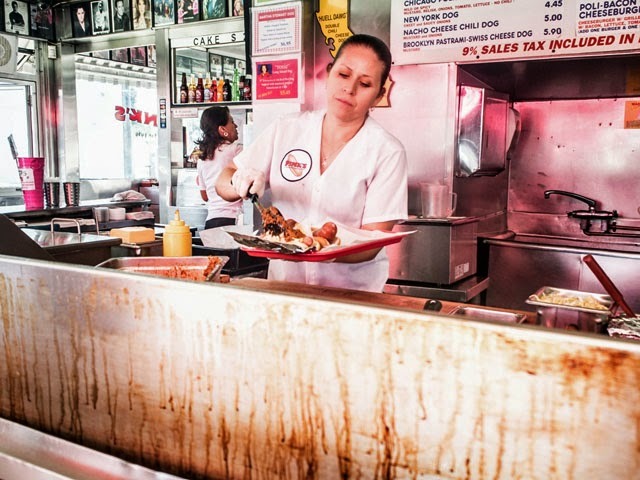 No one seemed to be serving hot dogs yet, but there were three women busily readying the counters. I parked my car down the street, ran down to Pink's and took my place in line. At that moment, I had not had breakfast, and it seemed like a hot dog wouldn't be such a bad idea. We all eat carb and protein mixes for brekkie everyday, this one would just be a bit more imaginative, right? After ten minutes of standing in line, at 9:25, I had three people still waiting in front of me and ten standing behind me. People seem to eat hot dogs at 9:30am in LA. Or perhaps, all these people thought the same thing as me in that moment - if this is the only way I can get a fix and avoid a line, I'll do it regardless of the time. 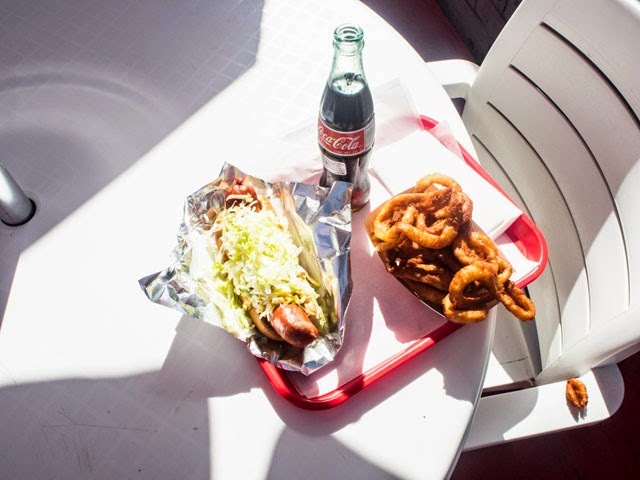 By 9:35, I was sitting down on the back patio of Pink's hot dogs with a Polish Dog, onion rings and a Coco Cola. Now a word of warning, people. 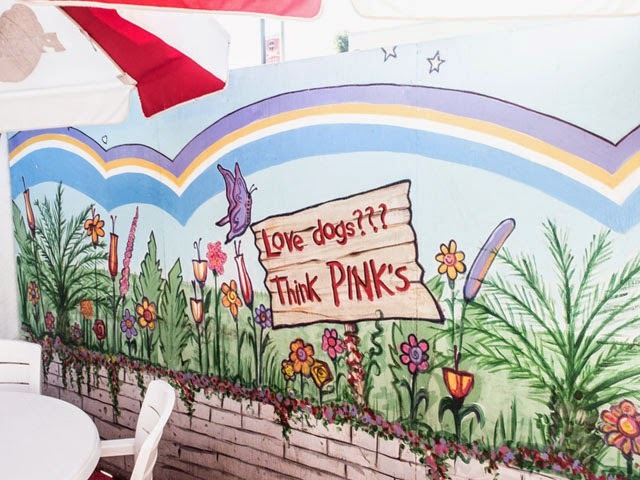 The big dogs at Pink's are hot, damn hot. You do have to give them a minute to cool after ordering. I was starving and went in for the kill and nearly lost all feeling in my tongue because of it. Start with the side order and leave the best for the middle meal. 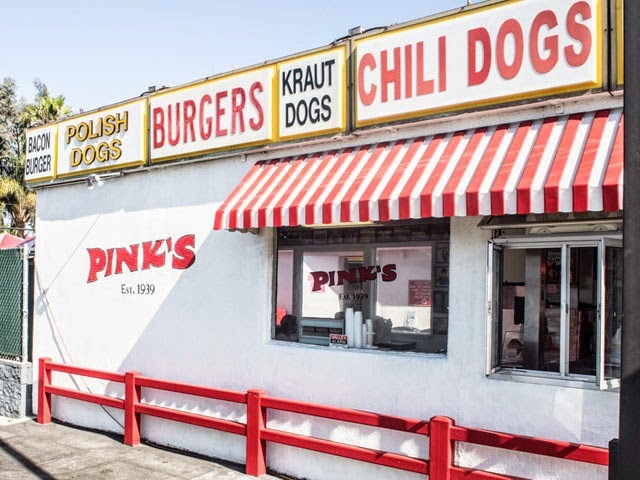 Everything you can imagine being right about a hot dog was discovered in my second less tongue flaming bite of a Pink's hot dog. 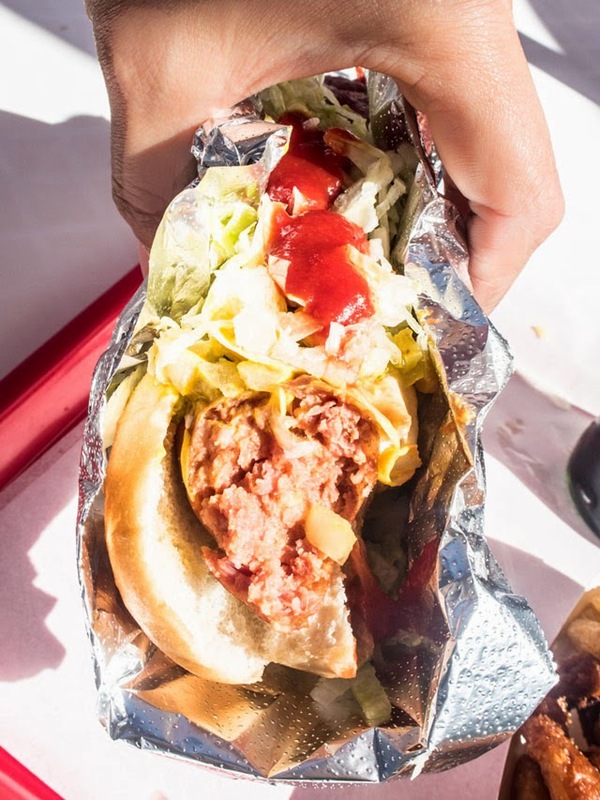 It burst in my mouth as I broke the casing, and the flavours of the dog, mixed with relish, lettuce and ketchup, woke me up faster than any morning coffee I'd ever had before. Don't worry, Starbucks, I haven't found a replacement. I couldn't even begin to finish the massive meal I had underwritten, which greatly saddened me. I made if half way through the dog and couldn't continue. A fierce case of eyes being bigger than the stomach. 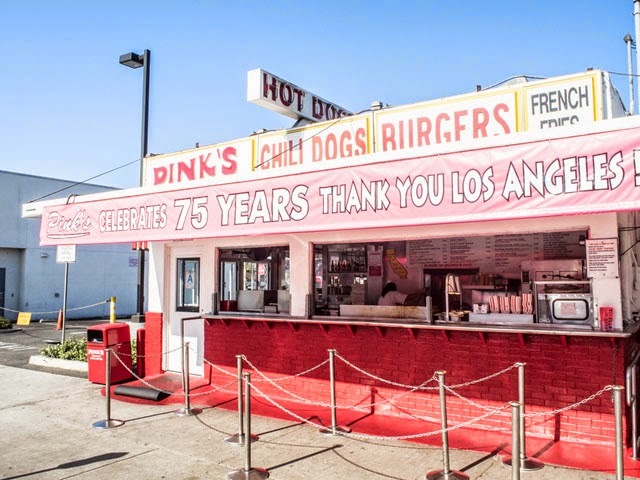 I did, however, walk away proud to say that I'd experienced the magic of Pink's hot dogs in Los Angeles and will gladly return and queue at a decent hour of the day to have the whole thing play out from start to finish once again!